822 days = 19,728 hours = 27 months = 1,183,680 minutes = 2.25 years = 71,020,800 seconds. That’s how long I’ve been without my son. That’s how long it’s been since I delivered Calvin into this world with his eyes shut and a still heart. Since I held him in my arms. Since I watched his daddy rock him and sing to him. 822 days. That’s how long I’ve been walking on this endless path of missing my first child. Has it really been that long? Has it only been that long? I still wonder how I was able to survive those early days—the days when I wanted the world to open up and swallow me, when I wanted everything to stop. 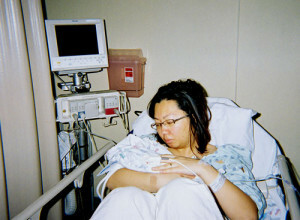 That’s when I learned that the body’s supply of tears is endless and that sleep only meant waking up to realize what happened and traumatize myself again as I remembered that I was no longer pregnant, that there was no baby to feed with my leaking breasts, that my son was dead. During this time, I had no room for anything else but grief. I had neither the heart capacity nor the patience for good intentions delivered in the wrong way, and during this time, through my eyes, you were 100 times more likely to say or do the wrong thing than you were to do right by me, or my husband, or especially by my son. I spent most of my days alternating between waking and crying then crying until I fell asleep again. I know I ate. Sometimes I brushed my teeth. Sometimes I showered, but never alone. At two weeks I felt pressured to go back to work, so I did. It was awful, and I felt out of place. Every place but at home, in my apartment, with my husband felt foreign. I somehow turned into an alien, so I pulled away from friends and family. After a while, the crying became less torrential. Or maybe the torrents just came less often. I started to have days during which I only cried once or twice. Then I started having days when I didn’t cry. I joined BabyCenter Community. I found the baby loss blogging community. I joined an 8-week bereavement support group at the hospital where I delivered Calvin. I met other parents who got it&emdash;the feelings of alienation, the pressure to move on, the constant pain and unbearable missing, the love for this child others thought we could so easily replace. They understood. They didn’t judge. They just listened and shared their own stories. I wasn’t so alone anymore. In the early days of grieving for Calvin, I did not want to get “better.” I did not want to stop crying for him. I did not want to stop aching for him. I wanted needed the pain to feel connected to him. I was afraid of forgetting him. I was afraid of others forgetting him. I did not want another baby; I wanted him. The more people told us to try again, the more pissed off I got at how easily they could dismiss my child. I wanted to stay in my bubble of grief and mourning and only surrounded myself with those who have had a loss, because everyone else just hurt me, just hurt my husband. If you couldn’t talk to me about my son or my grief, then I didn’t want to talk to you at all. 822 days, and, in some ways, not much has changed. 822 days, and, in some ways, a lot has changed. I still don’t have any living children. On day 280, I started missing a second child. On day 754, I started missing a third child. My husband and I look like a childless family of two, but the truth is Louie + me + Calvin, Rainbow, and Gaelen = a family of five, even if my babies aren’t here with me. I miss my babies everyday, and with every day that passes, I long for them even more, and I love them even more. Sometimes it’s hard to believe I could miss them any more than I already do, that I could love them any more than I already do, but I’ve learned that the heart has an amazing capacity to grow and fill with love and longing, even while it is bruised and broken. People still disappoint, but I am able to see past the action and words through to the intent. It still hurts, but it’s easier to forgive and let go of the anger. I still get defensive when others try to tell me how to grieve or how not to grieve (or not to grieve at all). I still get frustrated when people tell me to “relax” or “just love each other” or “stop trying” when it comes to having a baby. When it takes more than a year to conceive, and usually when it takes more than three months of actively trying, there is probably a little more going on than needing to go on vacation, stop focusing, and just “let it happen” (plus we’ve been there, done all of that). But I am able to check my reaction enough to save it until I can vent to people who I know will listen without judgment. My heart still aches. And the torrents of tears and sobbing and gasping and grasping at understanding of why my babies had to die still come. There are still triggers that hit unexpectedly, out of nowhere. But I don’t linger in the valleys of grief for as long as I used to, and I find myself there less often. I am walking the line of infertility. I never thought I’d need a reproductive endocrinologist—didn’t even know what that was before. And although adoption has always been an option I considered, I never thought it would be because I could not conceive a child who lives. I know so many more terms and acronyms regarding trying to conceive, infertility, birth defects, pregnancy, and baby loss than I would like to be familiar with and afraid of: TTC, POAS, FSH, TSH, PCOS, E2, LH, AMH, LP, LPD, IUFD, MMC, ABS, BBT, CM, 2WW, LBWC, RE, OPK, CBEFM, Uterine Didelphys, missed abortion, DNC, DNE, MUA, cord accident, hematoma, previa, pre-e, anencephaly, ovarian reserve, IUGR, placental abruption, GD, ruptured uterus, IUI, IVF, Trisomy 13, Trisomy 18, molar pregnancy, ectopic pregnancy, fibroids, uterine scarring, IC, MTHFR. But my husband and I will be okay with it if we never have a living child; I guess we just have to be. I still wonder why I was chosen for so many rarities: double uterus, Amniotic Band Sequence (and positive marker for Down’s Syndrome), a second trimester loss, three consecutive losses. I smile. I sing. I dance. I laugh. I joke. These things seemed impossible in the beginning, and I could not bear to see myself smiling in photos—it felt like a lie. I don’t feel guilty about finding joy anymore. I am rediscovering who I am. I am finding myself, my voice, my passion, my faith. I have more conviction in how I live, how I grieve, how I love. I’ve found art and writing again, and I am constantly exploring ways of creative expression. I have my babies to thank for this. My relationship with Louie is stronger, sweeter, and more forgiving. I am more in love with my husband than I have ever been, which, I think says, a lot after being together for over 12 years and starting our relationship in high school. I think of my babies everyday. My husband and I mention our children to each other everyday. And I’m no longer afraid of forgetting them. My life is good—not perfect; it will never be perfect on this side of heaven—but I am grateful and finally believe I can find happiness in this life. And this is right where I am, 822 days after giving birth to my dead son. Sweet Calvin, 822 days ago, you brought me happiness and love and peace I never knew I could feel, especially when my heart was so broken. You gave me purpose when I got pregnant with you, Calvin, and that has not changed. You are my inspiration; you and your sisters are my reason to seek joy in this life. Thank you for that. Happy 27 months with Jesus, baby boy. Mommy and Daddy love you, Rainbow, and Gaelen more and more and more. This was such a moving and poignant post – your love for your children resonates in every word. I am sorry that you have IF issues too – it seems so unfair to lose children and have such a tough journey to grow your family. I love how you wrote about finding yourself again. Reading all these posta has made me realise that I need to stop and do that in my life. Thank you so much, Jill. That means a lot. I hope you are able to make time and space devoted to finding yourself again. What a great post this is and I know I was glad to write it so I could see where I am at now compared to where I was in the beginning. I totally agree with the conviction. Always thinking of you. Thank you so much for sharing this post. I am so sorry that Calvin, Rainbow, and Gaelen aren’t all with you and Louie right now. You write so beautifully about them and about where you are, and what you say about finding your conviction and passion is very powerful stuff. Sending love. Thank you, Erica. Can I just say that I think your blog title, I Lost a World, is an absolutely perfect description of losing a baby? I look forward to getting to know you and reading more of your story. Angie, I really like what you said about their being gifts of Lucy’s life. It’s still hard to say that losing my babies have shown me blessings, but it’s true. Their deaths will never be a “good thing” in and of themselves, never never, but I have been shown goodness through my losses. Your story broke my heart, mostly because at least the first part of it is so very similar to my own. It was as if I was reading my own thoughts. It feels so refreshing to read that still, even after three years, I am not alone in my feelings. I wish many of my friends (or now ex friends) could read this post. I am so sorry for the loss of your precious Calvin and your other babies. You’ve endured so much. Now with the infertility as well. My heart absolutely goes out to you. Sally, I’m sorry that you’ve lost friendships; it’s so sad that losing friends is something that happens to many BLMs. Thank you for sharing that you feel the same way–it’s helpful, makes things less lonely. I just started reading your blog, and I love that you acknowledge you still have hope after losing your daughter, and I’m so happy you have your rainbow and your pot of gold baking away. I look forward to getting to know you more. may you and louie have many more years to come of marriage… with your rainbow children in the future. so sweet you guys were hs sweethearts! I remember the fresh grief and how every thing said to me was magnified hundred times – yes, those words truly hurt. i didn’t know about your medical complications; i am sorry to hear that. i can’t wait to see how many BLM stories will turn out years from now and whether the children will be added naturally or by adoption. Thank you, Patty; it’s nice to know I wasn’t the only one this happened to. It’s so rough where we are now, but it’s also wonderful (now that I’m in a less jealous place) to see BLMs getting their rainbows in different ways. I can’t wait for you to get yours, too, my friend.